Sydney Band 277 is a rock covers trio that has been performing around Sydney for the last 3 years. 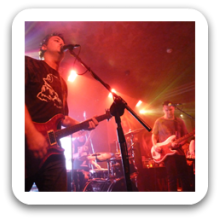 Consisting of full time, highly experienced, professional musicians, Sydney Band 277 are always set to impress. With a large repertoire of nothing but hit songs from the 70’s until now, Sydney Band 277 are able to tailor a night of music to fulfill your needs. Available as an acoustic ensemble using the same musicians, Sydney Band 277 are able to offer a quite set whilst your guests are having dinner, then turn it on for the full rock show experience. Can perform as a: Duo, 3, 4 Piece Band and are available to perform in Sydney and Surrounding Areas. Great band and very polite gentlemen. Our crowd ranged from toddlers to oldies and all thoroughly enjoyed the band. I have had very positive comments from the directors as well. We would love for them to come back again. Rock on! All the right music to get the big 50th going. Thanks for a great afternoon.